Looking for that perfect bouquet to WOW your lucky recipient? You found it. Previously Tried and Tested by Good House Keeping. This is a spectacular arrangement to show your loved one or friend just how much you care. With just the right blend of colours and contrasting textures, this fine bouquet will delight any lucky recipient. Our professional team of florists arrange each stem this arrangement to perfection. 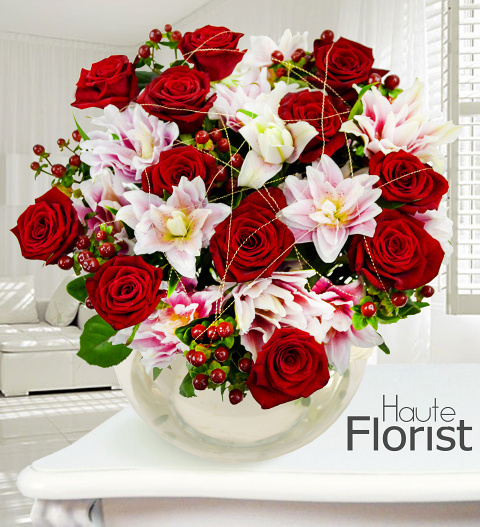 Included in this bouquet, you will receive Rhodos Roses, Hypericum, Thlaspi, Golden Orbits, as well as our unique and very special Double Flowering &apos;Roselilies&apos;. We are the first and only florist in the UK to sell these Roselilies which makes them truly special. Some of the most notable features of these sweet-scented beauties are the fact that they are pollen-free, longer lasting, and extremely rare. Available for UK next day delivery this superb arrangement comes packaged in a luxury wrap and bag for the perfect finishing touch.